Last week I covered human anatomy on Thingiverse; rad stuff, but mostly for show and educational purposes. Robotic arms though, they’re a bit easier to get functional. Print some joints, add a few servos and small metal bits, attach a microcontroller, and you’re on your way to having your own miniature robotic assistant. These arms are very rudimentary and a little clunky, but we know how these things go; the designs will be refined and the operations will improve as more people print and play with them. As you enjoy these printable robotic arms, I encourage you to think of how you might put them to use. This is well weighted, so it moves smoothly at slow speeds with (at least) 5 degrees of freedom. You can see it working here. This was CNCed out of hardboard, but could also be printed. This arm is controlled by an Arduino board, the current go-to controller for DIY electronics-involved projects. It’s a little top heavy, but the sound it makes is adorable. Check it out. What I really like about this one is that the software is included, and this arm is also controlled by an Arduino board, so this is an economical project. This is a rather sturdy and precise arm too; watch it move stuff! 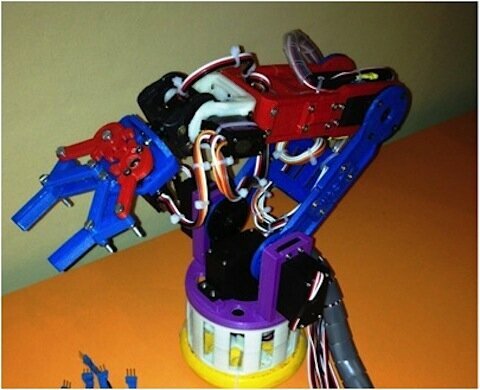 So what uses did you think of for a robotic arm? Soldering? Or assembly assistant? Handy. But what about opening doors, cooking, or feeding yourself with it? You probably didn’t think of those, but someone in a wheelchair might. It may not seem practical, but combined with the right hardware, these robotic arms can be controlled with thoughts. Sometimes possibility is more important than practicality.